Say and think of the Caribbean Sea and relaxation. Take for example, Santo Domingo, a favorite destination who wants to escape the cold winter: tropical climate, relaxation and many beaches. No fatigue. If in addition to the beaches, you want to see something “real”, historian, alive, then there is Cuba, and then there are the West Indies, Jamaica, Martinique, the Barbabos, and many other islands, where the watchword is sea, sea, and sea. But as with all rules, there is an exception: Saint Lucia. Saint Lucia, an independent state since 1979, is a small island located between the Caribbean Sea and the eastern Atlantic Ocean; it is located in the Lesser Antilles, north of Saint Vincent and the Grenadines. In short, one of the many tropical paradises of the Caribbean, complete with a sea and beautiful beaches. True, but also has the Gros Piton in Saint Lucia, for many the best panoramic view of the Caribbean. 786 meters above the sea, Gros Piton rises like a green lighthouse on the turquoise waters of the Caribbean. Completely covered by lush tropical flora, the walk up to the top at the moment is one of the most popular activities in Saint Lucia (in addition to that of doing nothing). But beware: the “outing” requires at least 4 hours of walking, ascent and descent, although the premium, the view from the top is worth the effort. 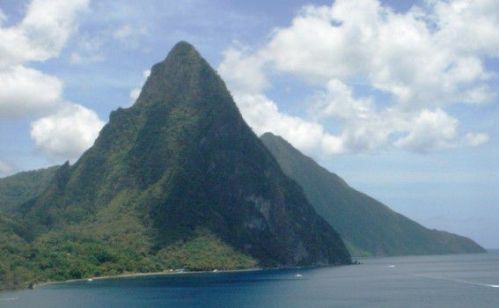 Saint Lucia has several attractions to offer its visitors, included to climb Gros Piton. Alternatively, you can decide to admire the peak by the gorgeous infinity pool of Jade Mountain and Ladera.